On Saturday 9th September the Festival of Resistance to Stop DSEI will be the biggest event of the Stop The Arms Fair week of action. Expect a bright and colourful party-protest with live music, speakers, workshops and dancing! It’s family friendly and all are welcome as we unite outside the ExCel Centre to shutdown the arms fair. Join us as we dance to disarm and party for peace! Plus: meditation workshop, craft tent, breakout sessions, live art from Art The Arms Fair, and loads more performers, speakers and DJs to be announced! Bring your family, friends, and fancy dress to this Festival of Resistance and stop the military equipment being rolled into the arms fair so it can’t go ahead! Head to Prince Regent DLR station from 10am then head east: there will be signs showing you where to go. War, repression and injustice start at DSEI. Let’s stop them here. Other actions planned 4-11 September. Info on knowing your rights at protests. Accessibility info about the site and the protest. 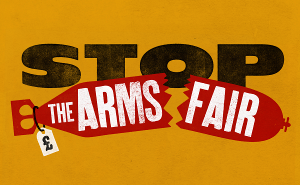 Contact info(at)stopthearmsfair*org*uk for further information.